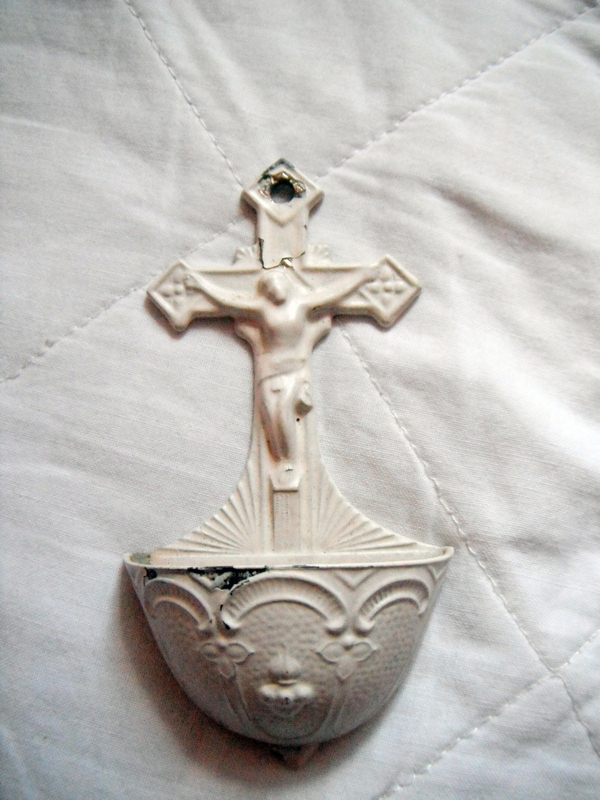 I’ve been cleaning up in preparation for my move and I found this holy water holder (apparently called a “font”). I rescued it from the trash a while back, and had more or less forgotten about it. It had white paint on it as was the style sometime in the past, but I thought it would look better without. So, I looked to see if I could find a way to clean it without harsh chemicals. Thanks to some advice found here, I discovered a good technique that uses only boiling water and baking soda. Here it is in process. 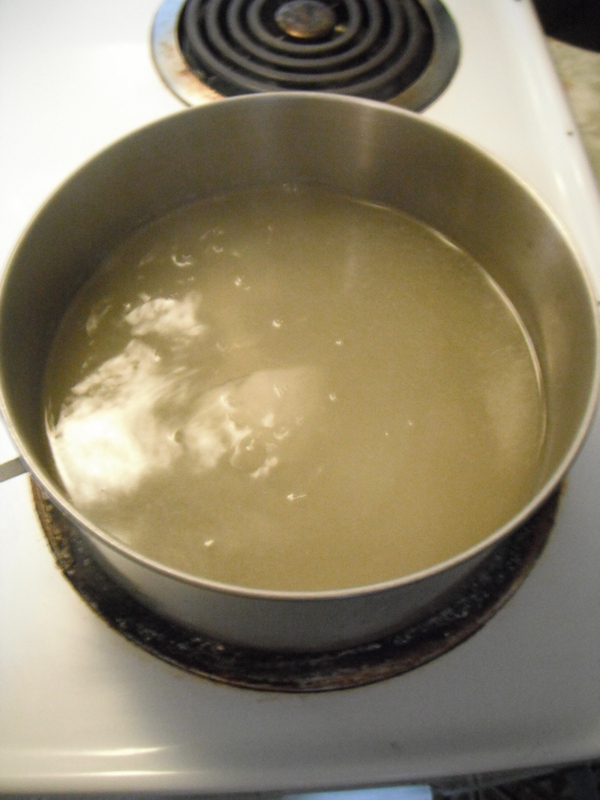 The technique calls for you to use a pot you won’t use to cook again, as paints can be poisonous, and this pot fit the bill. Now it’s way more shiny. I’m not sure what I’ll do with it: I could put it with my yard sale, or maybe I can get into using holy water, who knows. But, keep this technique in mind if you want to get paint off good metal items, it works pretty well! Nice work! I definitely like the “after” better. I’m trying to get a fix on the dimensions of the bowl of this holy water font. Maybe it would make a nice little planter for some trailing herb. Or, a block of floral foam (from the $ store) could be put in the bottom and then some shorter dried flowers arranged on top.. Here are three similar fonts. 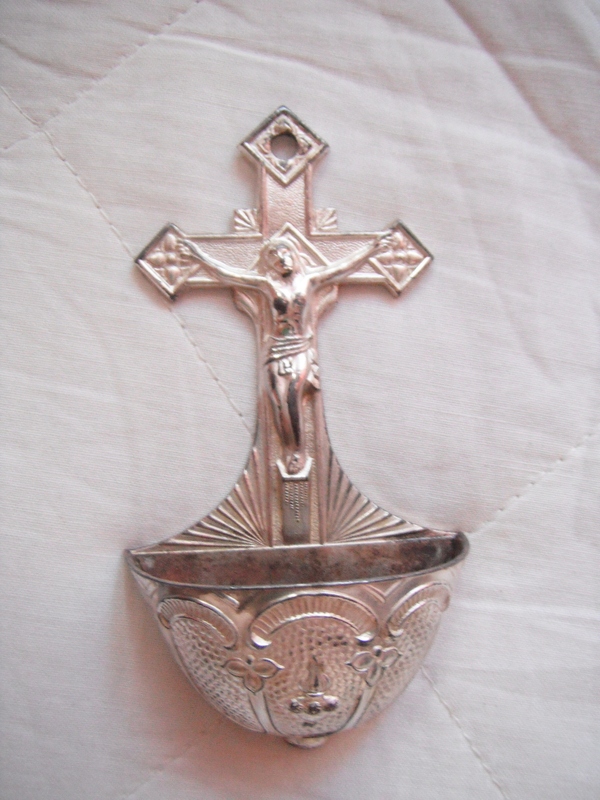 http://www.rubylane.com/item/350519-HW-60/Crucifix78-Holy-Water-Font ($115) http://www.ebay.com/itm/Small-Vintage-metal-Holy-Water-Font-Wall-home-size-Cross-/150878771044 ($13.50) http://marketplaceadvisor.channeladvisor.com/StoreFrontProfiles/DeluxeSFItemDetail.aspx?sid=1&sfid=72734&c=117387&i=262236113 ($15). Good searching! That’s pretty much the same type, except that mine now looks much shiner. Nice to see people charging a nice amount for it. I might not sell it for 1$ at the yard sale after all. That’s a totally brilliant tip – much better than paint stripper. Well found on the water font too. There’s something about religious artifacts (I was raised Catholic, but quit long ago ) that are interesting when they’re not something you particularly believe in. Thanks! I find that cleaning things with general household products (vinegar and baking soda being the major players) works really well. Makes me wonder why harsh chemical cleaners were invented in the first place. I might not post as regularly over the next week or so (I’m moving, and my camera is on the fritz), but check on back for some more finds!